What it’s like to be part of Robin Sharma’s 5 AM Club. Last week I joined the 5 AM Club. 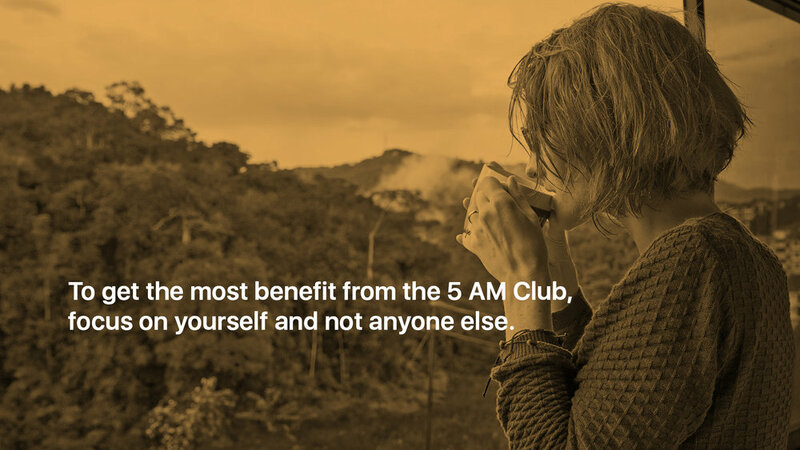 For those who don’t know, the 5 AM club is a concept started by Robin Sharma where you wake up at 5 AM do twenty-minutes exercise, twenty-minutes planning and twenty-minutes study. It’s a great concept and it is something I have been wanting to do for some time. I did modify the 20/20/20 structure a little. Personally, I don’t like exercise first thing in the morning and I believe planning the night before is more effective. However, I have taken the learning part and changed it to work better for me. After thinking about this question for a few days, I realised there was one skill I could learn that would have such an impact on my life. That was to become fluent in Korean. I live in Korea, my wife is Korean and my in-laws family are all Korean. Being able to speak Korean fluently would have a huge impact on my life. The question I had was “where would I find the time to consistently study?” The answer to that question was obvious; there really was only one time I could do it — 5 AM. The next question was: Could I wake up at 5 AM?. The reality is I have no choice. If I am serious about becoming fluent in Korean over the next twelve months then studying between 5 AM and 6 AM is the only time I know I can dedicate myself consistently to achieving this goal. So, Last Sunday, before going to bed I prepared all the materials I would need to have one hour of uninterrupted study time. I divided it up into three, twenty-minute segments and went to bed. 5 AM my alarm went off, I crawled out of bed, put the coffee machine on, picked up my iPad and began learning my Korean self-introduction. And so my journey began. The first day I was tired. My eyes were red and my body felt like I had not slept at all the night before. It was painful. Monday night was a struggle, but I managed to get all my work done. Tuesday 5 AM came along and again my alarm went off and again I crawled out of my bed. Again it was painful. Tuesday was the worst day. I felt exhausted all day. My body ached and it was made worse by having a lot of classes to teach that day. It was only then did I realise the obvious. If I was waking up an hour earlier than I normally did, I need the be going to bed an hour earlier. Once this obvious fact sunk in, I went to bed at 10:30 PM instead of 11:30 PM. That made a huge difference. Wednesday morning was fantastic. I woke up, felt normal and didn’t feel like I was crawling out of my bed. I managed to get through the day without feeling tired — well okay… just a little tired. Don’t deprive yourself of sleep. Go to bed earlier. From this experience, I learned that you need to adjust your sleep time. I usually get around six hours sleep, by waking up early I was only getting 5 hours and that is not enough for me. You, of course, may be different but most people require between six and eight hours sleep each night and you should not deprive yourself of it. If you are going to do this then you do need to prepare yourself properly and make sure that if you are getting up earlier at the front end, you need to go to bed earlier at the end of the day. Absolutely. I now understand the power of having that one hour every day to focus on myself. You don’t have to follow the 20/20/20 ritual of exercise, planning and study Robin Sharma suggests. You can create your own “Power Hour”. To get the most benefit from this hour, though, it should focus on your self-development. Whether you exercise, study, plan or meditate doesn’t really matter. What matters is you dedicate this time to spend on yourself. Never do work, check your email or social media or do anything for anyone else during this time. This is your time to do with whatever you like for yourself. Think of it as your special hour or, as in my case, my “power hour”. Will I continue with this? If nothing else I have learned I can wake up early and still function like normal human being. But what I have also learned is that by waking up at 5 AM and doing something important — learning Korean — that is aligned with my goals and my purpose gives me such a positive feeling of fulfilment. I know what I am doing will benefit me long into the future and at the same time I am building up my self-discipline which will just get stronger. With stronger self-discipline, I will be able to do more things that require discipline and that can only benefit me more. Once I have achieved my Korean language goal, I shall use this time to develop another skill. I really enjoy waking up and not feeling rushed. I love that feeling of having one hour to study something that will make me a better person, benefit my relationships and ultimately increase my income. What being fluent in Korean will do for me is almost limitless and that knowledge is all the motivation I need to lift my head off the pillow at 5 AM and begin the process of study.